Currently browsing posts filed under "Poetry"
What treasure for my boy? I said. That night, while lengthening shadows crept. And found this little treasure there. They lured my darling from my side. A watching for my baby boy! My watching will not be in vain. Merry Christmas to all, and Happy Holidays! The Pittsfield Word x Word Festival is a carnival of words in written, sung, and spoken form, both planned and improvised. Williams’ own prodigy of extempore, Seth Brown ’01, was the event’s Poetry Slam champion, so crowned on August 28 and reported in Berkshire Living. Wish I’d been there. The week-long Word X Word Festival came to a rousing conclusion on Saturday night with the crowning of Seth Brown as the poetry-slam champion at Shawn’s Barber Shop, followed by a music-and-spoken word show featuring 2004 National Poetry Slam Champion Rives at the Colonial Theatre to bring the curtain down on the festivities. It came as little surprise that Seth Brown won the Poetry Slam competition – anyone who has seen him recite, improvise, and freestyle before around town knows that he is a charming, funny and fleet linguist. He has the expressive face of a comic and poems – such as one about being a lover of books – that are tailor-made for a slam audience, and he has mastered the art of leaving space in some of his work for in-the-moment improvisation, including incorporating lines and references from other poets that have performed only minutes earlier. Brown is one to watch; he’s the Berkshires’ most likely to succeed in this exciting art form. I haven’t seen Seth poetry slam since he improvised a rhyming slam of Pat Buchanan when he publicly debated at Williams in 2002. I have seen him shine in a comedy night in a Pittsfield bar, the last time I had the pleasure of being his guest. We share a board game hobby that I look forward to indulging again in an upcoming overnight. Run by Dylan Tweney ’91, Tinywords publishes micropoetry and miniature poetry of all kinds, including but not limited to haiku. The site will publish one poem per day, most weekdays. RSS feed here, Twitter here. on an old, black bough. 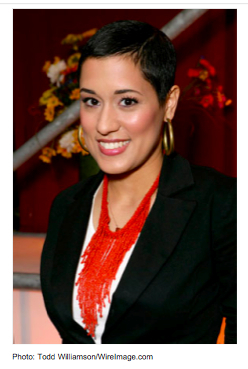 Spoken-word artist, Mayda Del Valle ’00 has been selected for the Oprah Power List. Sharing company with the likes of physicist Shirley Ann Jackson, four-star General Ann Dunwoody, artist Kara Walker, and comic Sarah Silverman, Del Valle is featured in the September issue of O Magazine. And after Shapiro conferred the Bicentennial Award on the six recipients, Del Valle took to the podium, which is just slightly shorter than she is, which she jokingly pointed out. She explained that she had agonized over her speech, holding up the nine page presentation that she had written. Of course, she said, she wasn’t going to use it. Instead, she recited a piece of slam poetry that she had written during her senior year at Williams. Then she launched into a recounting of her years at Williams, her journey through several majors and questionable choices that left her depressed and confused by the end of the first semester of her senior year. She told the audience that was when she intended to drop out. “I was going to bounce — I didn’t like who I was,” she said. But then she attended a performance at Mass MoCA with a friend that reminded her of her past in the south side of Chicago, where she had taken up performance art. After that, Del Valle knew what to do. She proposed an independent study course on her love for the performance art form, and from then on her life’s path was clear. In a voice loud with passion, clarity and a connection to the students in the audience, she said her plan made itself plain, that all her worry about what she should do with her life washed away. After another passionate and inspiring riff of slam poetry, the students, faculty, college officers and visitors treated her to a prolonged standing ovation. Good stuff. The Record provides a similar report, but without quoting any students. Was everyone happy with the event? Alas, no. Del Valle’s career success, unlike that of the others on the stage, relied completely upon self-centeredness and self-promotion. Keeping with this theme, she lacked the humility to recognize her fellow recipients in her speech, all of whom were better educated and had spent many more years than she had building their careers. Most importantly, all of them had been working to directly improve the lives of large portions of society, and, as a result, society as a whole. Del Valle, on the other hand, practices a self-absorbed art, a form of entertainment that appeals to a few, in which she is recognized for “knowing herself” and speaking of her struggles. A proud Latina, she often referenced the struggles of her ancestors. Eugene Latham ’55, through his organization, helped to provide care for 25,000 orphans in Latin America (people without ancestors). Instead of pondering the struggles of Del Valle’s relatives, I found myself wondering what the other medalists might have had to say to the class of 2009. Harsh! It is one thing for Fiona Worcester ’09 to not like Del Valle’s talk. I sit through lots of talks I don’t like. But to feel strongly enough to write a letter to the Record? Wow. Question: How did other readers like about the speech? EphBlog is powered by WordPress and delivered to you in 0.872 seconds using 39 queries..